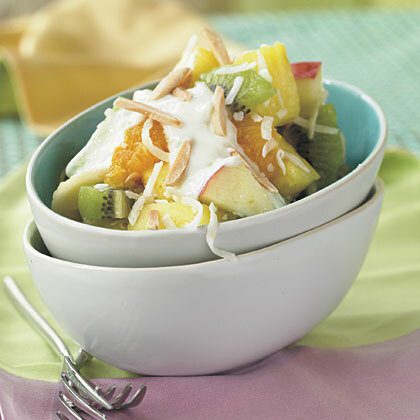 Honey-sweetened yogurt spooned over fresh fruit is a refreshing addition to any meal. You can prepare and refrigerate the yogurt sauce up to a day in advance. You can also combine and refrigerate the fruit mixture (except the banana) up to three hours ahead; stir in the banana just before serving to prevent discoloring. Combine pineapple and next 4 ingredients (through coconut) in a large bowl; toss gently to combine. Just before serving, stir in banana. Top fruit mixture with yogurt sauce; sprinkle with almonds.